The two attacks killed 34 people including three children of the prominent scholar Sheikh Ibrahim El-Zakzaky, head of the Islamic Movement. This is not the first time that the al-Quds Day procession in Zaria has been attacked. In 2009 four people were killed and several injured when police opened fire on civilians. 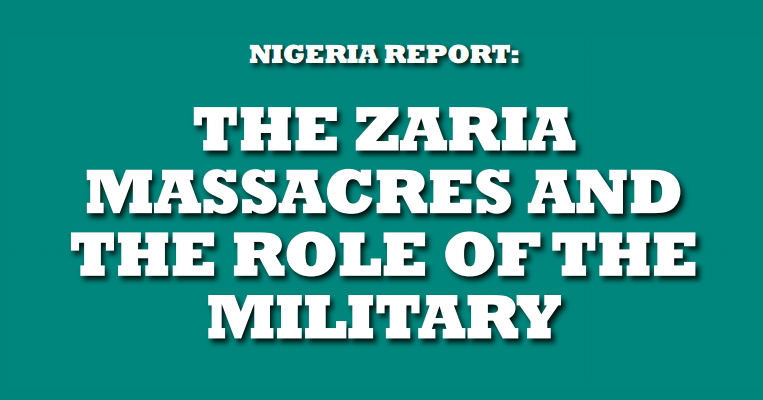 Islamic Human Rights Commission (IHRC) sent a fact-finding mission to Zaria on 30 July 2014. The mission was led by IHRC Chair, Massoud Shadjareh. This report is based on its interviews with victims, their families and also eye-witnesses. The findings include video footage of Nigerian soldiers firing on unarmed civilians located at the tail end of the procession in Zaria on 25 July. Thirty-two people died. Bystanders were among those killed in the violence. Over 100 people were injured. There is evidence that many of those arrested died in military custody. Reports indicate that some were taken into detention alive and well and later emerged dead with their bodies bearing signs of being beaten. Others who were injured were detained for hours and brutalised before being allowed to seek medical treatment. According to eye-witnesses, three truckloads of soldiers opened fire at the procession without warning. The following day three truckloads of soldiers approached the Husainiyyah Baqiyyatullah, the headquarters of the Islamic Movement in Zaria, and opened fire on people standing outside. Two people died and seven were injured.